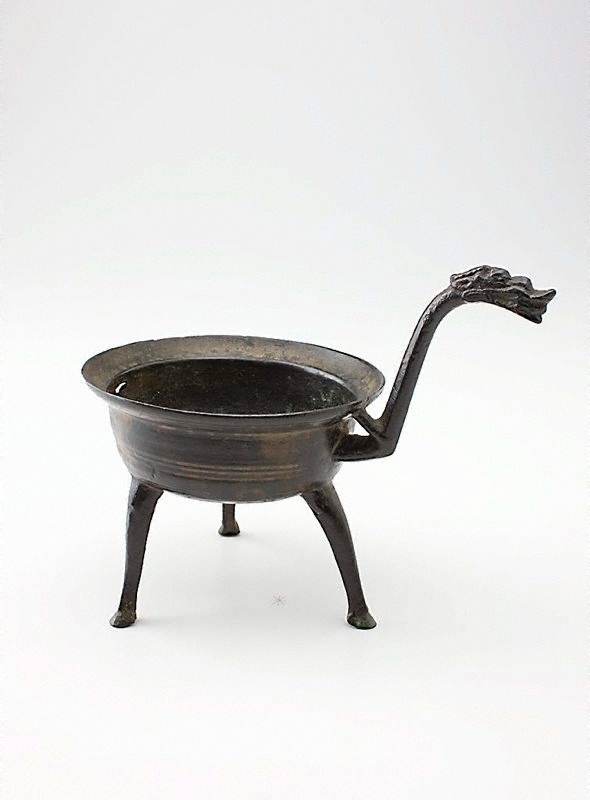 As with most Han bronzes, this tripod utensil is marked with a simplicity and plainness at odds with the elaborately decorated ritual bronzes of the preceding Shang and Zhou dynasties. The dragon's head, as cast on the long handle, may not have had a deep religious meaning, serving instead as an auspicious symbol. The 'jiao dou' was a wine-warming utensil, examples of which have been found in archaeological contexts placed atop iron stoves. Early Chinese Art , Sydney, 1983, (illus.) not paginated. cat.no. XVIII. See 'Further Information' for text.